Yeah, No! Standard Marketing Principles [Still] Apply! Naturally this home sold. In 21 days, in the market of Winter 2011. Once the staging was in place. It had been on the market for a year prior, with 2 different realtors, lots of showings and many price reductions. But no-one had been able to convince the owner that standard marketing principles apply, even when selling a home. Just as much as when you sell any product. The product (aka your home) has to be positioned towards its targer buyer and presented with maximum appeal. It doesn’t matter how the homeowner chooses to use their product [men, read: how often your wife uses a steak knife to open a package!] This is no indictment on how anyone chooses to live in their home. When you go to sell your house, if it is set up for a single lady tenderly caring for aged pets then that’s who the likely buyer is… are those folks buying houses right now? No. The folks buying right now are young professional couples, and in this price bracket, it is a young professional couple with no kids. 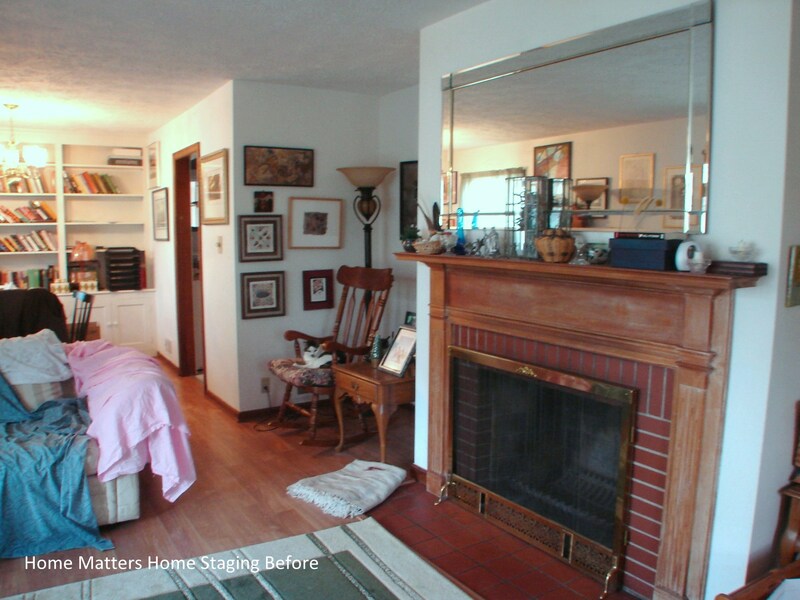 In addressing this home’s marketing, Linda persuaded the homeowner to move out. “Living differently” was simply not an option with the dogs, and so the owner moved to a friend’s garage apartment. Linda used none of the homeowners’ stuff, preferring instead to start from scratch. The house was deep-cleaned, and then repainted. Simple, generic furnishings were added to accent the floors, fireplace, built-ins and nook. That nook offers a calm desk space where the worker can gaze at the fireplace for inspiration. You can SEE how the life would work there! Once Linda was finished merchandising (what the rest of us might call accessorizing) the home was reintroduced to the market at the same price it was before. And it sold in 21 days, an unusual success in this marketplace even for the HomeMatters team. Linda had the lady on a 60 day contract, with month to month after that. They didn’t need it. And why? Linda Barnett, on a mission, to creatively position each home for sale with merchandising, style. . . and standard marketing principles! For more information on our training programs, and how you can workshop with Linda, please check out our stager training options. What a great example of the valuable services you provide. Now it makes me want to see the rest of the house! Love the living room after staging!